Stuff: Your cart is empty. Try saying that three times fast. Mega Muscle Milk, mega Muscle Milk, mega... ok enough. 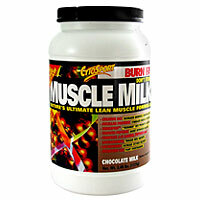 :) We're featuring a new product each month and for this month we're featuring the ever popular Muscle Milk. Cytosport's Muscle Milk has been in our top selling supplements for years now and has recently started inching its way up very close to top 10. Muscle Milk by CytoSport is a remarkable muscle formula that promotes efficient fat burning, lean muscle growth and quick recovery from exercise. Muscle Milk provides metabolically favorable ingredients stimulate growth and recovery much like a mother's milk nourishes a baby. i took muscle milk for about 1 1/2 months and my benh press went up about 25-30 lbs. not only did it work for me it is one of my favorite drinks. it gave me more energy than ive ever had in the weight room. The product is amazing! I lost body fat and increased pure, lean muscle everywhere. I am truly amazed. If you are trying to burn fat, get chizzled, and build lean muscle, then this is for you. Spring break cant get here fast enough!